Why should you consider SCMC? This program has little or no cost to the students or their parents. Students can enjoy a more independent learning environment with unique features from a traditional high school. Middle college graduates are among the most sought-after students in the nation by four-year colleges and universities. Students can gain exposure to the college experience and enjoy a more flexible schedule. 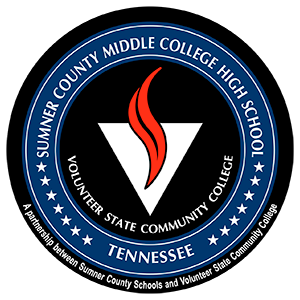 SCMC is designed to give students an opportunity to receive a high school diploma while earning credits toward a college degree or exploring vocational and career options. This is the right place for high school students who can better reach their full potential in a “non-traditional” school setting. Students can get a head-start on college and gain a competitive edge. Typical middle college graduates achieve 100% proficiency on high school benchmark exams. On average, 90% of middle college graduates transfer to a four-year college or university. Students can choose from a wide-variety of courses. This variety will help in career exploration and might not be available at a traditional high school. In addition, students will be able to focus on degree choices in liberal arts, technology, health, business and more. And since students will also be Vol State students, they will be invited to participate in college clubs and activities.